Written by Ray Martin on April 16th, 2019 April 17th, 2019 . 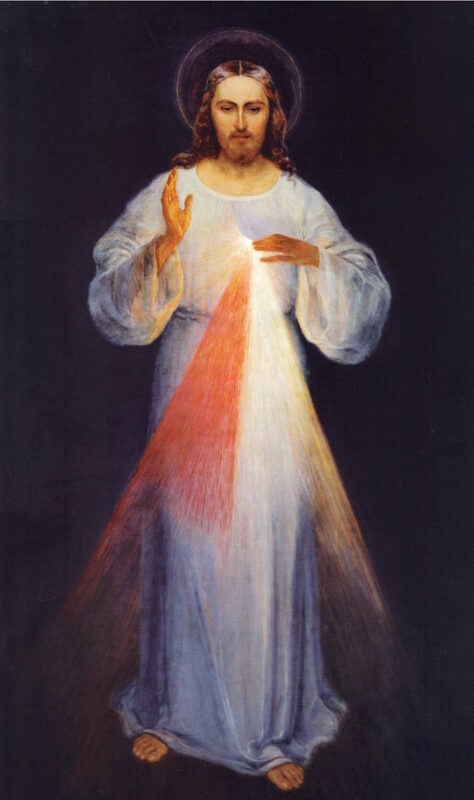 Original painting of the Divine Mercy (by Eugeniusz Kazimirowski in 1934). Public Domain courtesy of Wikipedia. I knew that Divine Mercy Sunday was always after Easter and that it was a day to recognize the victory won for us by the resurrection of Christ, but after hearing Fr. Alessandro talk about it during his homily on Easter where he said that Jesus wants to offer us “special graces” that will flow down on Divine Mercy Sunday and how we should participate in going to confession, I thought maybe there’s more to this feast day than I’m aware of. The more I started looking into it, I realized that I really had no idea what made this coming Sunday so important. I knew there was an image, a painting of the image that St. Faustina saw and that she had written a diary, but that’s about all I could come up with. So What is Divine Mercy Sunday? Well, Pope John Paul II declared that the Sunday immediately following Easter should be Divine Mercy Sunday. Why? Apparently in the 1930’s Jesus told St. Faustina, a nun from Poland, that not only should we celebrate a Feast of Mercy, but that it should be the Sunday after Easter. Pope John Paul II made this surprise announcement in a homily on May 5, 2000 when he Canonized St. Faustina who had written the messages that she was being given by the Lord. Catholics aren’t forced to believe in the visions of St. Faustina, they’re the tradition that the Feast is based on…but it’s not ALL that it’s based on. Even back in the Old Testament we hear about the mercy of God, and then Jesus himself spread a message of our merciful Father who wants us to show mercy to the sick, the poor, the naked, the thirsty, etc. The ultimate act of Love demonstrated by Christ in dying on the Cross showed us that there’s no sin so great that can’t be forgiven by God if we chose to turn back to Him. What Makes Divine Mercy Sunday So Special? Reconciling with our Father is the biggest benefit of this Feast of Mercy. There are many ways to do so, but what marks this day so extraordinary is that there’s a Plenary Indulgence offered by The Church, a special one. What’s The Difference Between A Plenary Indulgence & Going To Confession? I’m glad you asked because I had to look it up myself! Here’s my understanding: when we are given absolution from our sins through the sacrament of Reconciliation, the priest says, “I absolve you from all of your sins”. As an ambassador or representative of Christ himself, we are forgiven in that very moment from our sins. (If you aren’t sure who gave them the right to do so, check out John 20:22 where Jesus breathes the Holy Spirit on the Disciples and tells them to go forgive sins). The Church says that after we confess, we are no longer separated from the love of God meaning we’ll go to heaven, but depending on what we did God might keep us in Purgatory for a little while. Yes, we’re reconciled in our relationship with God, however there could still be a temporal punishment where we need to be purified on our way to eternal life in communion with the Saints. A Plenary Indulgence however, can eliminate even the temporal punishment, or time in purgatory. The Plenary Indulgence offered by The Church on Divine Mercy Sunday is unique because rather than being available for others or souls already in purgatory, it’s only available for yourself. How Do We Celebrate Divine Mercy Sunday And Get These Extraordinary Graces? Ascension will host a prayer service at 3:00pm this Divine Mercy Sunday April 23rd, 2017 in the church where we will sing a Divine Mercy Chaplet, offer the sacrament of Reconciliation, and experience Adoration before the Blessed Sacrament. All are welcome to attend! For more on Divine Mercy visit www.thedivinemercy.org or USCCB. Read the article What Makes Divine Mercy Sunday Such A Big Deal? Written by Ray Martin on April 10th, 2019 April 10th, 2019 . We’re excited to announce the inaugural season of the Ascension Couples 9-Hole Golf League forming this Spring. In this league, the most important things are developing friendships and having fun! Golf will be played at Falcon Valley Golf Course in Lenexa, KS on the 4th Saturday of the month from May through September. We will scramble with a shot-gun start! Cost: $75 per couple for each session. Includes green fees, cart, one drink ticket per person and prizes. Dinner will be available at an additional charge. Please register at least 2 weeks prior to the date you wish to golf. Email Beth Hartung at beth.hartung@yahoo.com with questions. Written by Ray Martin on March 12th, 2019 March 12th, 2019 .